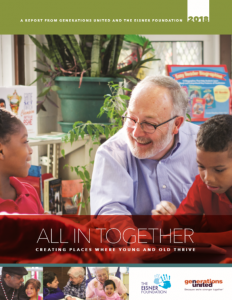 All In Together: Creating Places Where Young And Old Thrive is a report from Generations United and The Eisner Foundation that includes the findings of two national surveys, profiles of model programs and recommendations for how we can increase the number of the intergenerational shared sites. While far from a household name, shared sites may well be a concept whose time is now. There’s a convergence of opportunity at hand, brought about by a variety of factors including the demand for quality children and youth services, the need for creative older adult programs and limited local, state and national resources for construction and rehabilitation of facilities. The use of space by multiple generations makes common sense. Demographics are also fueling innovation. Americans are living longer and healthier lives. The growing asset of older adults needs to be engaged and shared sites are a smart and innovative way to do that. 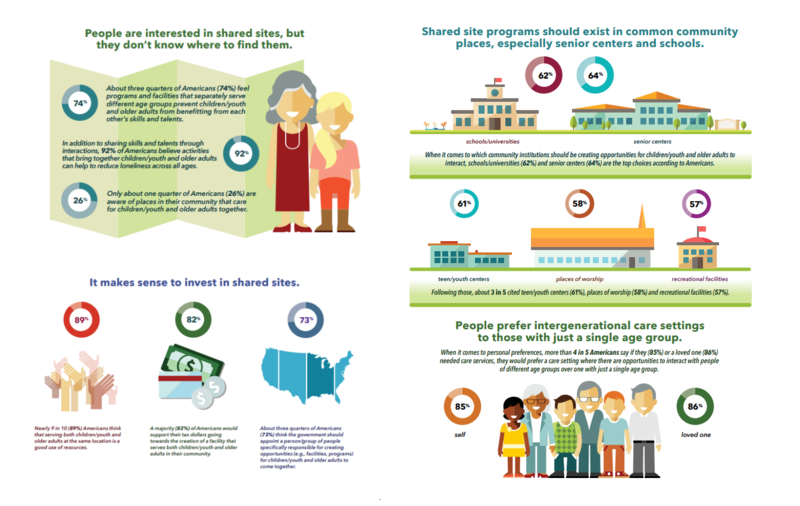 Initiate a local, state and/or national intergenerational shared site learning collaborative.